There is something about Mickey Mantle that baseball card collectors just love. Sure he was a good player — one of the best ever — but the enthusiasm for his cards go beyond the numbers on the back of them and taps into the mystique of the man on the front of it. Mickey Mantle is featured on some of the most valuable cards in baseball history. 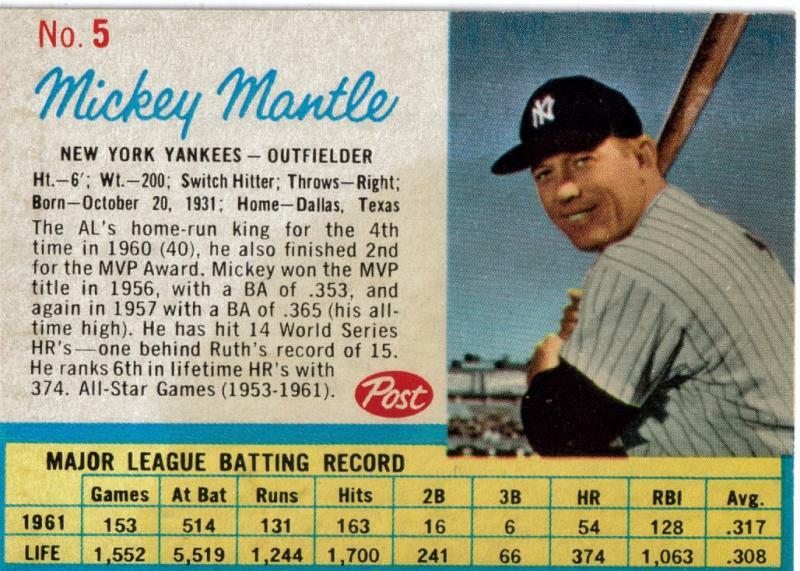 Read on for the five most famous Mickey Mantle baseball cards, in order of fame and value. By the mid-fifties baseball cards were becoming a big business. Topps, which was established in 1952, quickly became as the industry leader. But Bowman fired a real slavo in the card race by signing Mickey Mantle, Pee Reese and Roy Campanella to exclusive contracts, meaning they could only be featured in Bowman sets. In 1955 Topps bought Bowman, in part so they could start printing Mickey Mantle cards again. You can find 1954 Bowman Mickey Mantle cards in the PSA-8 to PSA-9 near mint range on eBay for around 6,000 dollars. The most ever paid for a 1954 Bowman Mickey Mantle was $28,920. This painted card features a notably young looking Mantle wearing his Yankee uniform. In fact, it is the first baseball card ever to feature Mantle in New York’s iconic pinstripes. It also has a copy of Mantle’s signature on its front. On the back the card there are Mickey Mantle’s stats, which say he slugged 13 home runs and hit .267 in 96 games. Although he was still a better than average hitter in 1951, it was also the worst offensive year of his career. He was, however, only 19 and a rookie. A mint condition 1952 Bowman Mickey Mantle would be worth around fifteen grand. Near mint versions can be found on eBay for between five and six thousand bucks. This would be the second Topps Mickey Mantle card and the last Mantle Topps card until 1956. The card features a close up of the Mick looking over his shoulder, his blue eyes glistening in the sun. The 1953 Topps set is also famous for its clean, now-classic design. 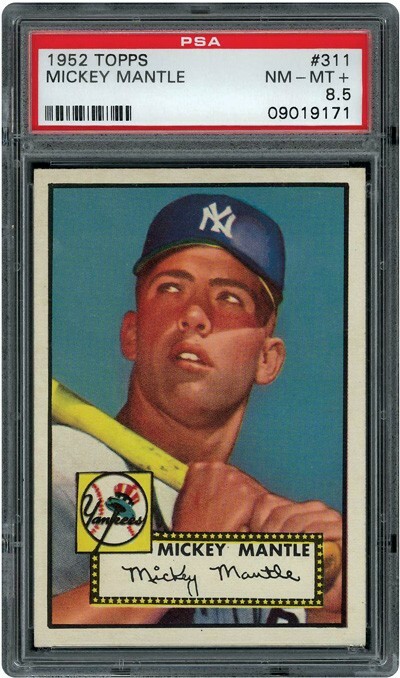 In 2009 a high grade mint 1953 Mickey Mantle went for almost $88,000 and a PSA-8 went for $12,788. If you search eBay in 2013 you can find 1953 Mickey Mantles in very good to near mint condition for between four and seven thousand dollars. Technically, Mickey Mantle’s rookie card, although not his most famous. The card, printed before Mantle completed his first season with the Yankees, is a painting of the future Hall of Famer in his batting stance with a Yankee cap and an anonymous blue sky backdrop. Since it was part of Bowman’s late year high number series, which had less prints than the rest of the set, it’s even more valuable than it would have been otherwise. In 2008 a mint condition Mickey Mantle 1951 Bowman was auctioned off for $600,000. Not only the most famous Mickey Mantle baseball card, but the arguably the most famous baseball card of all-time. (The Honus Wagner T206 and the Mickey Mantle Bowman 1951 are both worth more.) Part of its value is derived from being part of its set’s high number series, which gets printed later in the year. In 1952 the high number series sold particularly poorly, so much so that tTopps executives dumped tens of thousands of the leftover cards into the ocean. 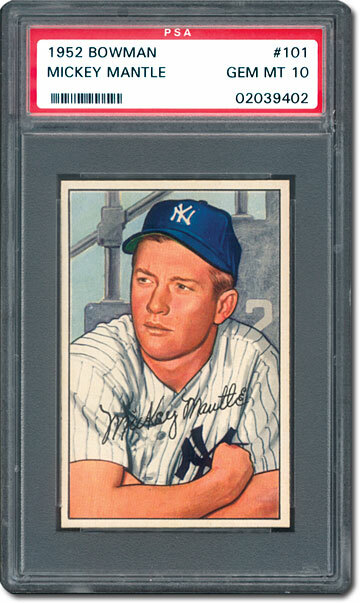 In 2001, a gem mint 1952 Mickey Mantle (one of only three known to exist) sold for $275,000 at an auction. If that same card was sold now its possible it would exceed the six hundred thousands dollars the Mickey Mantle Bowman 51 went for.